Thank you to everyone who has contributed to the second phase of our church's interior; covering the dome, windows and pendentives. Please come and see this incredible work, it is a rare opportunity to see the ancient form of iconography applied right here in our home town of Mount Pleasant. 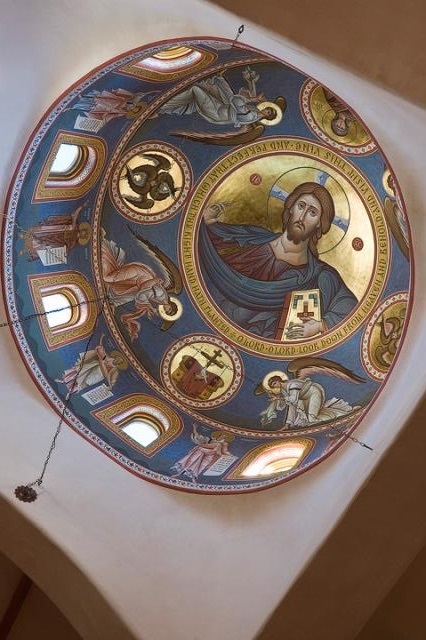 Dome Iconography: The dome frescos will be created by the same extraordinary iconography team that painted the apse. The large icon at the top of the dome, known as "Christ Pantokrator", graces the interior domes of Orthodox churches throughout the world. "Pantokrator" is the Greek for The Almighty or Ruler of All, and appears in the Old Testament as The Lord of Sabbath. This fresco serves to remind us of that God is with us! The Pantokrator shows us God coming down here, because God became man in Jesus Christ. Blessing with his right hand and holding a Gospel Book in his left, this reminds us that He is also the Coming Judge. On the Dome, which architecturally represents Heaven, Jesus is surrounded by a host of Holy Angels. And between the windows stand the Old Testament Prophets, who foretold Christ's coming in the flesh. Pendentives: The four Evangelists will be featured in the pendentives (the curved triangles supporting the dome). Authors of Biblical Gospels, their writings are the link between the dome and nave; Heaven and Earth. Windows: The twelve windows in the Dome will be fixed with special glass block arranged in a pattern found in some of the most ancient Orthodox churches still standing in the world today.